Incredibly thin and compact, the TPMC-8X is brilliantly designed to provide a powerful mobile control solution that's easy to hold and intuitive to use. Its magnesium alloy enclosure presents a sleek, modern appearance that is both rugged and lightweight. An integrated 5-way thumbpad and up/down arrow buttons add quick-access and tactile response for controlling functions ranging from simple volume adjustment and channel selection to on-screen menu navigation or even pan/tilt camera control. Four additional "hard key" buttons are positioned below the touchscreen, programmable for context-sensitive menu functions. A stylus is even included for use with the on-screen keyboard, conveniently stowed in its own storage slot. The built-in fingerprint scanner unleashes a whole new level of convenience and security, allowing individual users to be identified instantly and logged on automatically. 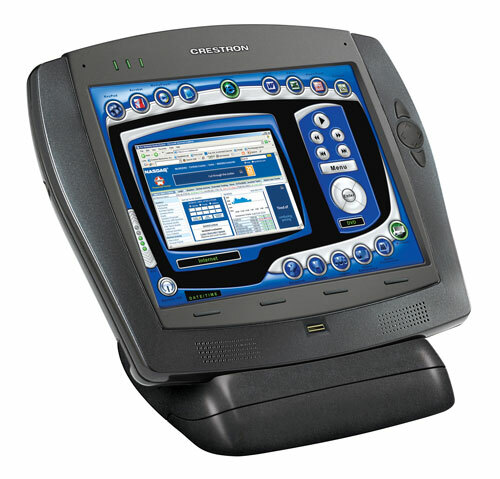 With just the touch of a fingertip, each user can be presented with a unique graphical interface with its own set of preferences, access privileges, and even its own look through the use of touchpanel "skins". Integrated 802.11a/b/g Wi-Fi technology with WEP encryption delivers secure, high-speed 2-way wireless performance across wireless LAN's, affording mobile freedom and seamless communications with Crestron control systems, computers, digital media servers, and other IP-based devices. The power of Isys is in its embedded PC engine, combining rock solid touchpanel performance with built-in Windows Media Player and RealPlayer, Internet Explorer, Adobe Acrobat Reader, and Microsoft Word, Excel, and PowerPoint document viewers. While simultaneously controlling your home theater, boardroom, or lecture hall, the TPMC-8X provides everything needed for enjoying online music and movies, viewing Web pages and accessing most types of digital media without necessitating a separate computer. VNC Viewer support delivers enhanced cross-platform interaction with remote computers over the network or Internet, allowing access and control of desktop applications with live presentation capability. Built on the Windows XP Embedded operating system, the TPMC-8X delivers a powerful and secure platform for touchpanel control with integrated PC capabilities. Programmatic control erases the lines between control system and PC, allowing programmers to customize each application's behavior within the touchpanel environment to create a truly powerful and user-friendly interface. For presentation preview, surveillance, or pure entertainment, the TPMC-8X makes it easy to view security cameras, movies, and other video sources right on the touchscreen. In addition to the wide range of streaming video formats supported by its onboard media player applications, the TPMC-8X also features native support for video over IP from a variety of 3rd-party Web cameras and servers including the Crestron CEN-NVS100. Built-in amplified speakers and headphone output provide clear audio for streaming media and internal PC applications, and enable 2-way IP intercom in combination with the integrated microphone. Crestron IP intercom capability facilitates direct panel-to-panel intercom and monitoring right over the wireless LAN. Customized WAV files can also be loaded on the touchpanel to add dimension to the touchscreen graphics with personalized sounds, button feedback, and voice prompts.